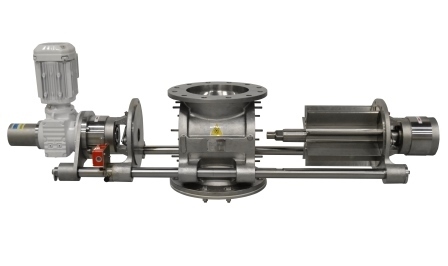 HDMF heavy-duty modular fast clean rotary valves are operator-friendly sanitary rotary valves that provide powder processors increased productivity with their patented Rotalign self-centralizing bearing assembly. The design reduces downtime to clean and inspect the valve’s internals, improving productivity, especially when frequent cleaning is required. No special tools are needed to access the inside of rotary valve, which offers access to both end covers simultaneously. In addition, the rotor can spin freely, which makes cleaning and accessing all sides of the rotor easy. Special tapered-bore design and guide rails provide scratch-free rotor extraction and insertion.